This video will introduce you to adding images to ‘Managing Comments’ inside WordPress using this quality unbranded video tutorial. Depending how the ‘Discussions’ settings are configured on your site, new comments may need to be approved before they can be seen on your site. 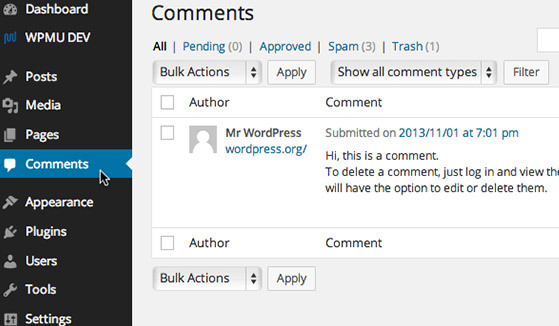 When a new comment is made a comment notification will appear next to ‘Comments’ in the WordPress dashboard. Access the the comment manager by clicking on ‘Comments’ in the sidebar. To view only ‘Pending’ comments, click the ‘Pending’ filter above the list of comments. Filter ‘Comments’ by clicking the links above the comment list. Hover over a comment to reveal an action menu with options to ‘Approve’, ‘Reply’, ‘Quick Edit’, ‘Edit’, mark the comment as ‘Spam’ or delete the comment. You can un approve or re approve comments as many times as you like. Clicking ‘Reply’ gives you a quick option for replying right from the ‘Comments’ screen. ‘Edit’ and ‘Quick Edit’ let you make changes to information about the comment author, the status and the comment itself. Hover over a comment to reveal the action menu. If you receive a spam comment, marking the comment as ‘Spam’ will help make the anti-spam plugins on your site get smarter. Deleting a comment will move it to the comments ‘Trash’ folder and be held for thirty days before it is permanently deleted. You can ‘Restore’ or ‘Permanently Delete’ a comment by clicking the ‘Trash’ link on the comments screen and using the action menu that appears when hovering over the items held in the trash. This ‘Managing Comments’ tutorial will give your users, clients or internal staff a frame work for managing and editing comments inside of WordPress.